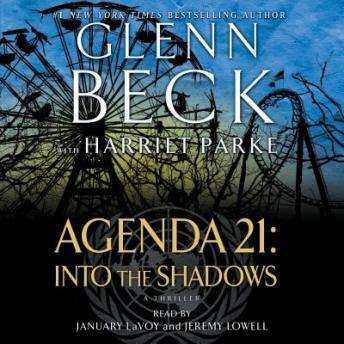 The sequel to Agenda 21, from #1 New York Times bestselling author and nationally syndicated radio host Glenn Beck. It was once named America, but now it is just “the Republic.” Following the worldwide implementation of a UN-led program called Agenda 21, the once-proud people of America have become obedient residents who live in barren, brutal Compounds and serve the autocratic, merciless Authorities. Citizens mainly keep their heads down and their mouths shut—but Emmeline is different. When the Authorities took her mother away, she started questioning the world around her. What happened to her mom? Why is everyone confined to grim living spaces and made to eat the same food cubes every day? Why was her own baby taken from her to be raised in the Children’s Village? And are the rumors that somewhere out beyond the fence live those who got away during the Relocations—the so-called shadow people—really true? When Emmeline’s questions lead to the realization that she will never see her child again, she decides to escape the Compound with her partner, David, and their baby, Elsa. Fleeing the armed enforcers of the Earth Protection Agency, and facing the unknown for the first time in their lives, Emmeline and David run into the shadows in the desperate hope of finding something they’d only heard stories about from those who’d lived before the Relocations: freedom. Great information and story telling. I couldn't wait to read this second part of Agenda 21. This is so suspenseful and truly shows how power begets ignorance. This is another must read. This was just awful. This is the first book I returned without finishing in over three years.